Mobile Ready Websites. Why does your website need to be mobile ready? Because visitors to your site need it to be. MOBILE READY WEB DESIGN - WHY? Why should your website be mobile ready? Because those visiting your site need it to be. What web-enabled 'device' are you using to view this website - a desktop PC or a laptop perhaps? Statistically speaking, at least 50% of you are viewing it using a touch-based mobile device such as a Smartphone or Tablet. And that percentage is only set to increase, making desktop and laptop users a minority when it comes to those visiting any website. 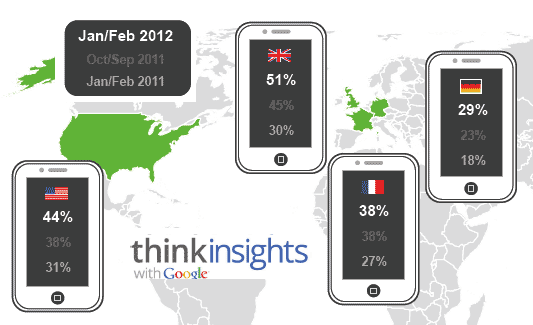 Research by Google, that even now is over a year old (Feb 2012), shows a massive increase in Smartphone usage, with the UK having the highest increase of all. Similar increases are repeated with Tablet usage. The results of Google's research is reflected in many other surveys. What is more important to realise though, is that the Smartphone is an 'always on' device, making the Web accessible at all times from virtually anywhere. Smartphone users have their device with them all day, everyday, wherever they go. So would you say these people, using these devices, are less important to you than those using more 'traditional' means to access your website? Websites designed for Desktop and Laptop PCs (90% of websites) do not work well when viewed on Smartphones or many Tablets. Mobile users are constantly having to pinch and zoom in order to read a site's content, whilst navigation links can be impossible to target (touch based devices use fingers to activate links, not a mouse cursor). Overall this makes for a frustrating, unpleasant experience for the mobile user. 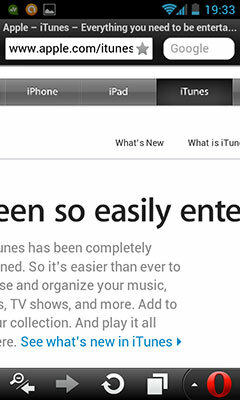 The two screenshots below (Apple's iTunes) show what it is like for someone using a very common Smartphone device (Android OS, with 4 inch screen). Firstly, they get the whole site (designed for a large screen Desktop PC) compressed down in a 2.5 inch space - virtually all text is too small to read, and all link buttons are near impossible to select (to press using fingers). Of course the Smartphone user can attempt to randomly zoom and hope the device's Web Browser will find a suitable 'column'. But as the screenshot shows (above right) this is a bit hit or miss? Another 'not in the least bit mobile friendly' website! 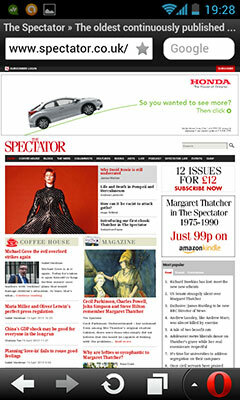 Another example (above) of a website that's not mobile ready - The Spectator. The same problems as before: differcult to read and hard to navigate your way around? 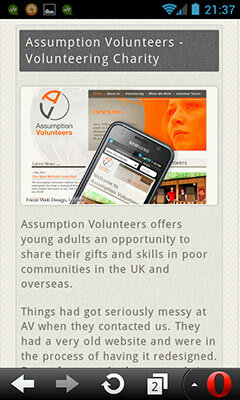 And Now ... A 'MOBILE READY' Website! The screenshots above show how a website should be presented to a Smartphone user - everything is either scaled or wrapped so that the user merely needs to swipe (scroll) up or down to access all the site's content. 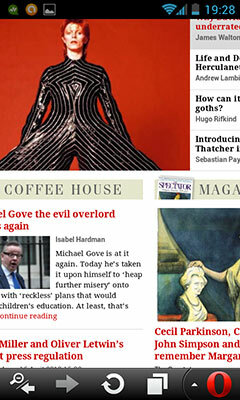 Navigation is easy too, with large finger-sized 'buttons' to press (click). This makes for a far better 'user experience' for those with mobile devices? "But what about the Desktop user", we hear you ask - "that layout is going to look strange for them?" But of course the desktop user gets a different layout. 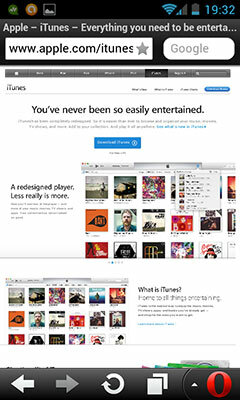 The Desktop user is presented with a wider, two column layout with larger images and longer line lengths. Essentially this website responds to the user, presenting the content differently, depending on what device they are using. 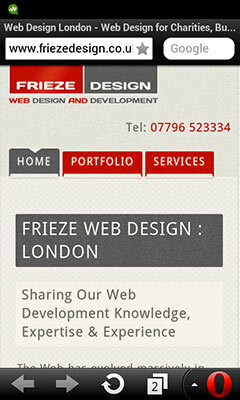 Mobile Ready is a sister website produced by Frieze Design to highlight the importance of having a website that works well on mobile devices. Please contact us if you need help making your website 'mobile ready' or if you have any questions about the topics covered here. 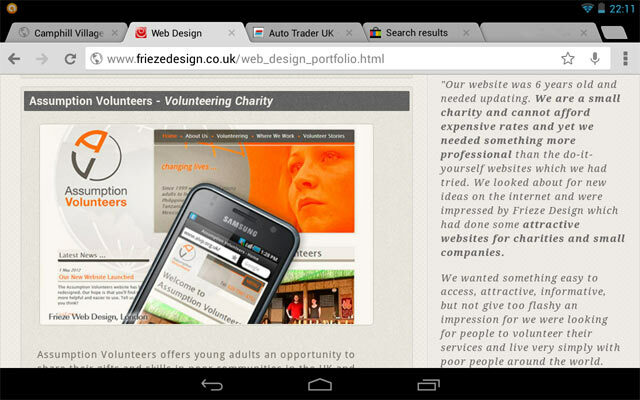 "80% of UK Smartphone owners use them to access Websites"
"Do you have a mobile-optimised website? If you don’t, this should be your top priority for engaging mobile customers. 57% of users say they won’t recommend a business with a poorly designed mobile site, and 40% have turned to a competitor’s site after a bad mobile experience." "Smartphones have become an indispensable part of our daily lives. Smartphone penetration has risen to 51% of the population and these smartphone owners are becoming increasingly reliant on their devices. 59% access the Internet every day on their smartphone and most never leave home without it. *This email address is reserved exclusively for our customers and for those wishing to make 'enquiries' about our services. It should not be used for any other purpose.